Fall of Babylon (539 B.C.) - The Neo-Babylonian Empire's rise was meteoric, but very short-lived. After the death of Nebuchadnezzar, things deteriorated rapidly. The succeeding kings were weak and ineffectual. More ominously, a new power was rising to the East. Recall the Median Kingdom which assisted Babylon in the downfall of Nineveh. The Medes initially ruled a related people called the Persians. But in the years that followed, the two flipped roles. Under a brilliant young general named Cyrus, the Persians quickly supplanted the Medes and would go on to accomplish things never seen previously in history. After bringing the Medes to heel, they looked outward to foreign lands. Starting with the Kingdom of Lydia in Anatolia, which they conquered in 546 B.C.. Then Cyrus turned his attention to Mesopotamia. While all accounts agree that he conquered Babylon, there is some variance on how he did it. The two most direct sources, the Nabonidus Chronicle and the Cyrus Cylinder, indicate that the Persians and the Babylonians fought at the Battle of Opis, a city on the Euphrates north of Babylon. The Persians won an overwhelming victory which prompted Sippar, another city north of Babylon, to surrender within days. 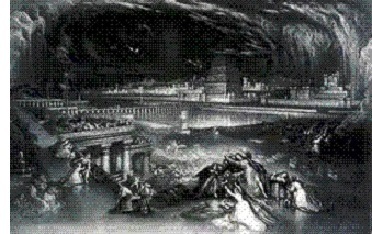 Then Cyrus entered Babylon, apparently without a fight, and took the city. The Greek historians, Herodotus and Xenophon, both write about the capture of Babylon by Cyrus in a rather creative manner. Because of the city's impenetrable walls, the Persian army had to find another way to breach its defenses. The Euphrates River, which ran directly through the city, was diverted by way of a canal, and the water level dropped to the point whereby it was low enough for the army to enter beneath the walls. The Babylonians were taken by surprise and again surrendered without a fight. There is a fifth source, the Book of Daniel. It confirms the fall of Babylon to the Persians, but does not say how except that the Babylonian king, Belshazzar, was taken by surprise. He was holding a huge banquet on the night of the invasion. Having to have known that the Persian army was near, he must have felt secure behind the city's walls. One thing that all sources seem to agree on is that King Belshazzar was extremely unpopular among his own people and Cyrus was welcomed as liberator, not a conqueror. The Fall of Babylon saw an end to Mesopotamian independence. For the first time, since the beginning of history, the "Cradle of Civilization" ceased to control its own destiny.